Target auditorium – I study cycle students from business management, financial engineering, economical engineering programmes. 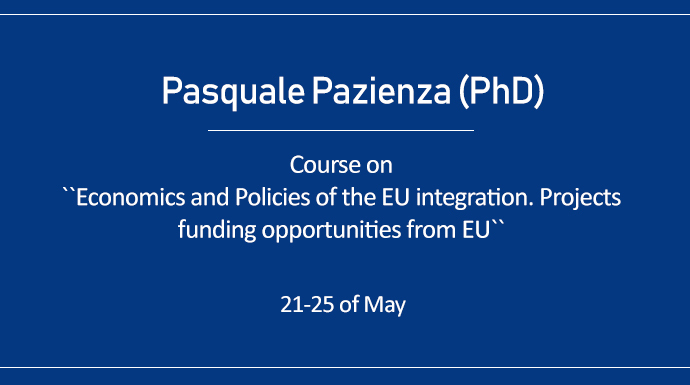 Course title: Economics and Policies of the EU integration. Project’s funding opportunities from EU. The objective of the course is to deepen some of the issues of the European economic integration. In some more details, after highlighting the main issues of the economic history which have characterised the integration process, the course will develop an analysis of the EU institutions and of the economic foundations such as those specifically related to the federalism theory and subsidy. Peculiarities and opportunities of projects direct and indirect funding from the EU. Pasquale PAZIENZA (PhD) gained his MSc in Environmental Economics from the University of York (UK) and a PhD in Policies for Territorial Sustainable Development from the University of Bari (Italy). He also gained a PhD in Economics from the University of Durham (UK). At present, he is a professor of economic policy and economics and policy of the EU integration in the Department of Economics of the University of Foggia (Italy). His teaching activity is developed internationally with experiences in various European universities (UK, Poland, Spain, and Lithuania). Issues such as those related to energy policy, the impact of FDI, food markets and sustainability, tourism and local development are among his main research interests. He has been a member of various European and international research teams. In addition to his academic commitments, he has previously worked as a consultant for various local socio-economic development plans in southern Italy and, more recently, he has been worked as a local government representative for the Province of Foggia (Italy).